Thermëa by Nordik Spa-Nature is a Scandinavian-style spa in Winnipeg, Manitoba, Canada. Focused around the concept of “thermotherapy,” Thermëa is a secluded getaway located in the heart of the city of Winnipeg. Like many other spas, you can get massages, facials and other body treatments performed by licensed professionals. But there is one thing that sets Thermëa apart from your average day spa. It’s called The Thermal Experience. Jess and I got the opportunity to check out Thermëa for ourselves and explore the unique benefits of this outdoor spa. Janis, Thermëa’s marketing director, gave us an exclusive tour of The Thermal Experience, as a crowd gathered outside waiting for the spa doors to open. Despite the spa being at maximum capacity that day, it wasn’t crowded and the mystical steam rising up over the outdoor pools provided a sense of separation from the other guests. Read more about all the benefits of thermotherapy, and why it’s an awesome form of self care for moms. *This is a sponsored post meaning free passes were exchanged for an honest review. Please note that while this post does contain health and wellness information, I am not a medical professional and nothing in this post should be taken as medical advice. I am simply a mother who has been there and lived to tell the tale. Thermotherapy is a type of physical and psychological therapy powered by temperature. Heat therapy is known to have many benefits, and has been used by medical professionals, physical therapists and athletes for decades. The process of alternating heat and cold is known to speed up recovery in cases of muscle injury. A rapid change in body temperature can also eliminate toxins from the body, increase blood circulation, relieve stress and strengthen the immune system. Thermëa offers a unique way to experience the benefits of thermotherapy. The outdoor spa is a beautiful maze of pools, saunas, steam rooms and various indoor and outdoor rest areas – all available for use with one daily pass. The Scandinavian style of the spa, with it’s minimalist wood and stone elements, fit perfectly against the backdrop of Winnipeg’s ever-changing weather. The bare trees and snow covered ground made it feel like a mountain-top retreat away from the noise of everyday life. As breath-taking as the grounds of Thermëa are, they’re not just for show. The layout is actually designed to encourage guests to follow the 3 Step Thermal Cycle. The first step in the thermal cycle is to heat things up. Exposing the body to heat helps to open up the pores and causes you to sweat out all the bad toxins in your body. There are two dry saunas and two steam rooms to choose from for the heat cycle. The popular Finlandia dry sauna holds Aufguss rituals every hour, during which a staff member infuses the stones with ice and essential oils and then uses towels to circulate the hot air and steam around the room. These sessions do get crowded, so make sure you get there early to choose a spot. And keep in mind that the higher up you sit, the hotter it gets and the faster you’ll sweat it out. The two steam rooms are located in the Vaporo building, one infused with eucalyptus, the other with orange essential oils. The steam in the rooms is incredibly dense and as soon as you walk in the door you can feel it take over your entire body. After a cycle in the steam room, there are scented exfoliating salts available to scrub all over your body and a shower to rinse them off. This helps to get rid of dry skin and wash away the layer of gunk that you’ve just sweat out. Once you’ve completed a hot cycle, you now need to expose your body to a cold temperature. This will improve your blood circulation, close up your pores, speed up your heart rate and boost your adrenaline levels. If you’re brave enough, plunge through the Polarbër pool which is extremely cold and works really fast. Or you can stand underneath the Icebër waterfall for a few seconds. As shocking as the icy water might feel, try your best not to scream. The main areas of Thermëa are silent, and if you missed one of the hundreds of signs that say “whisper” a staff member will gently remind you (Jess took the liberty of testing that theory out for herself). If you’re not a fan of submerging yourself into icy cold water, the Tempër pool is comfortable but still cool. If it’s a colder day outside, you can simply walk around or sit by one of the many fire pits instead. The cold cycle only needs a few seconds to work, but you can literally feel your heart start pumping and the adrenaline rushing through your veins. And finally, our favorite part of the thermal cycle – the rest cycle. Resting after exposure to heat and then cold will turn all that adrenaline into endorphins. Increasing our endorphin levels can help relieve stress, improve our mental health and create an overall sense of calm and happiness. The Relaxa relaxation chalet consisted of two different areas. One had comfortable heated benches with tons of natural sunlight and was perfect for reading. It even had ropes to help you get comfortable in the seats without too much effort. The Tellura section was warm, dimly lit and stocked with heated mattresses, perfect for meditating or napping (which we totally did)! Just outside the room, you can help yourself to a variety of organic teas – supplied locally by Cornelia Bean. The Restö on-site restaurant was another great place to relax while enjoying a gourmet meal made from locally sourced ingredients. If you’re visiting with friends, it’s one of the few places where you don’t need to whisper. There were several different places to sit but all the areas are heated and closed to the public so fine dining in a bathrobe was the ultimate luxury. After you’ve had a sufficient rest period, you can begin the thermal cycle all over again. By completing the cycle three or more times, you can enjoy the maximum benefits of thermotherapy, as well as explore all the different features that Thermëa has to offer. The facility is open from 9 am until 10 pm and guests are welcome to stay for the entire day. Interestingly enough, the atmosphere seemed to change constantly throughout the day. The early morning sunrise brought a sense of peace and serenity. By the early afternoon, it felt warm, sunny and uplifting. We ended our visit around 4 pm but would have loved to stay longer and see how beautiful the place is when it’s lit up at night. There are no time limits, schedules or restrictions, which was a welcome change to our normally busy lives. You’re welcome to take a 2 hour nap in your favorite spot or hang out in the hot tub all day long if you want to. Everything is self-serve and you can wander throughout the grounds as you wish. It was clear that the staff worked hard to maintain the environment of peace and relaxation. They were constantly restocking, discreetly cleaning, tending to the fires and gently reminding everyone to keep their voices down. Why is This So Good for Moms? Thermëa is an amazing place for all adults, regardless of age, gender or physical limitations. But moms in particular can benefit greatly from using thermotherapy on a regular basis. Both pregnant and postpartum moms can get relief from muscle aches and pains (obviously, check with your doctor first). It tones the skin and increases elasticity, which will help restore post-pregnancy skin. Encourages better sleep and helps ward off fatigue and exhaustion. Increases mental clarity, concentration and memory. Detoxifies the body which boosts the immune system. This is especially important for moms with school age kids who bring home all kinds of germs. A spa day is the ultimate luxurious self care option for moms and a visit to Thermëa or one of Groupe Nordik’s other thermotherapy spas should be on every mom’s bucket list. After spending the day at Thermëa, including a hearty lunch and an afternoon nap, I felt completely renewed and refreshed. And as we drove away, I was simply counting down the days until I could return again. Get A Thermal Experience for less than $60 CAD. Our mental health struggles evolve with the seasons. Throughout the year, our mental health will go through a series of highs and lows. Whether you’ve been struggling with seasonal affective disorder, depression, anxiety or another mental illness, you may find that it’s worse at different times throughout the year. In order to improve your mental health, you must consider all the different factors that each season brings. Here are some ways that you can improve your mental health this year, broken down by months. The first step to improve your mental health throughout the entire year is to start with a plan. You only have to plan out as much or as little of your year as you’re comfortable with. The simplest way to do this is with a calendar of the full year. You can choose a large desk calendar, a smaller personal calendar, an agenda or a bullet journal. Start by filling in all your important dates. Write down everyone’s birthdays, anniversaries, work schedules and appointments. If you have a vacation coming up this summer, write it on the calendar in great big bold letters! Don’t forget to schedule in your self-care time! Then, make a list of goals you hope to achieve and put the dates you want to reach them on your calendar. Think outside the box when it comes to your goals, don’t be afraid to celebrate the small wins. For example, if insomnia is a problem for you, then set a goal to get one straight week of decent sleep. Keep your calendar somewhere you can see it every single day, and don’t forget to update it each month with new tasks and goals. Having a plan in place, with attainable goals, will help you feel more organized and confident and ultimately improve your mental health. 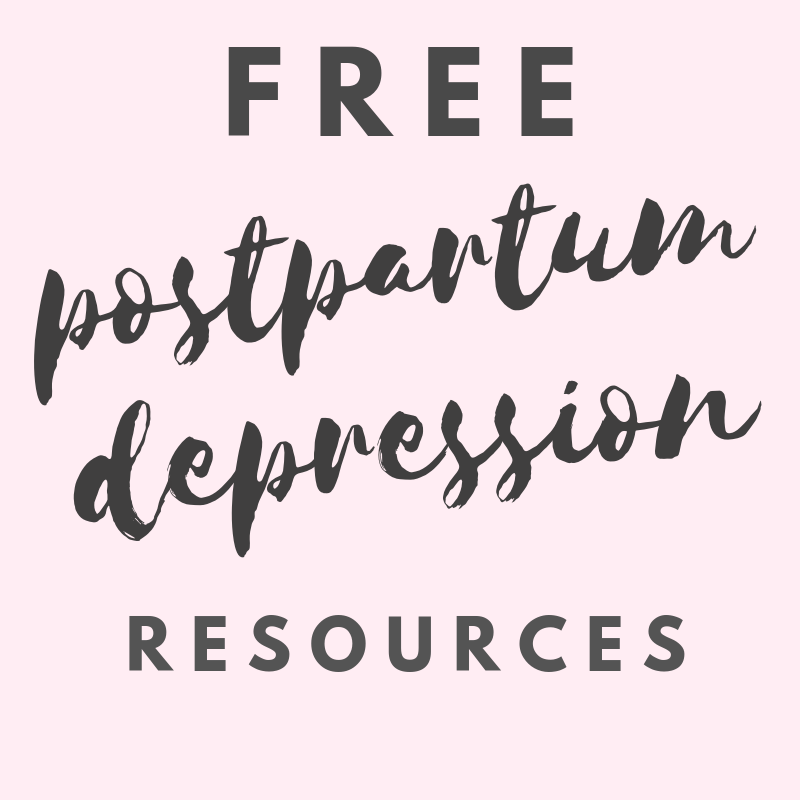 Download a free printable PDF calendar in the Postpartum Depression Survival Guide Free Resource Library! Click here to subscribe for instant access! Finally, the last of the winter months! Take some time this month to embrace the cold weather before it’s gone and enjoy all things warm and cozy. The Scandinavians refer to this practice as “hygge” (pronounced hoo-gah). The cold and darkness of the winter months can have a strong effect on our mental health, especially if you suffer from seasonal affective disorder. But knowing that spring is right around the corner can bring a glimmer of hope and actually improve our mental health. So celebrate the end of winter by getting in one last fire in the fireplace, drink all the hot cocoa and stay in bed as long as you want. It’s time for some spring cleaning! But I’m not talking about dishes and laundry and other everyday tasks. One of the best ways to improve your mental health is to get rid of all the junk piling up in your living space. Decluttering your environment is a great way to declutter your mind as well. Take a few tips from Marie Kondo and organize your spaces. Clean out your closets, drawers and cupboards. Get rid of anything that doesn’t have a purpose or bring you joy. Sort through your paperwork and try to go digital wherever possible. You don’t need to go full minimalist, but having clean, organized spaces can do wonders for your overall mental health. With the arrival of spring, it’s the perfect time to try out your green thumb. Gardening is a form of eco-therapy that can help to improve your mental health. Escaping to your garden can be a form of self care, and there are many indoor plants that offer great health benefits. Gardening is also an activity you can opt to do with the kids. Not only do they love playing in the dirt, but they can learn so much about the environment and where food comes from. If you have picky eaters, they’ll be more likely to eat vegetables that they’ve watched grow in their garden. Plant some seeds this month and you’ll have something to occupy your mind all summer. Watching your seedlings grow will give you a sense of pride and accomplishment that will boost your mood and self confidence. Warm weather is just around the corner, so it’s time to pamper that dry winter skin. Our skin and sense of touch has a big impact on our mental health. That’s why we can feel so overwhelmed and frazzled when we’ve been over-touched all day by our kids. For months, our skin has been exposed to harsh temperatures, covered up and neglected. It’s time to book a spa day or massage and facial or even just plan some DIY pampering at home. Try out a new summer hairstyle, get a pedicure before breaking out the flip flops and switch to a lighter makeup routine for summer. Focusing on your outward appearance can boost your confidence and improve your mental health. Finally, the world is bright and green again. Spend as much time outdoors as possible this month. Your body has been deprived of Vitamin D, sunshine and fresh air for months, so get as much of it in as possible. Go for a walk, run, hike or bike ride. Outdoor activities often feel less like exercise than going to the gym, and exercise is so important for maintaining your mental health. Don’t put pressure on yourself to get your bikini body ready, either. Hang up a hammock, dust off your patio chairs or lie right on the grass and relax, completely guilt free. Even having your lunch or morning coffee outside will do wonders to improve your mental health. You made it through the winter so sit back and enjoy the warmth and sunshine while you can. Do you remember summer vacation as a kid? If you have fond memories of summer camp, beach days, camping trips or playing from sun up to sun down, then embrace that and be a kid again this month. Plan some camping trips or beach days. Swim as often as you can, no matter what you look like in your bathing suit. Head to the splash parks and let loose. Take up a new sport that you’ve always to try. Channel your inner child and just have some good old-fashioned summer fun. Don’t forget to take a ton of pictures and maybe even put it together in an album to look at each year. When you’re battling a mental illness, it’s probably been a long time since you had any real fun. Remembering a happy time from your childhood can help to improve your mental health in the simplest way. This month, it’s time to focus on something that’s so important for our mental health, but often neglected. Our support system A.K.A. our friends. It’s not unusual to withdraw from society while battling a mental illness but what we don’t realize at the time is how important it is to have a strong support system around us. So focus on those friends this month. Host a backyard BBQ or plan a group camping trip. Only invite the people you want to spend time with and don’t feel obligated to invite anyone who brings negativity into your life. If you’re not ready to be that social yet, then aim for a night out with a couple friends that you’ve been meaning to connect with. Get out of your comfort zone a little bit this month, dust off your social skills and strengthen your social circle. Back to school season means that everyone is learning something new, so why shouldn’t you? September is a great month to take up a new hobby or learn a new skill. Think of something that you’ve always wanted to do. You could start making sushi, learn calligraphy or take a photography class. The possibilities are truly endless. Check Pinterest, a local hobby store or your bucket list for more inspiration. Distracting the mind with learning something new can improve your mental health by working your brain in a different way. Doing something artistic, such as painting, is a great way of expressing any bottled up emotions you may be harboring. And choosing something physical, like a new sport, can help to burn off any pent up energy. Our minds love a challenge, so put your brain to work this month. Just like that, the warmer weather is coming to an end. This can bring a sense of doom and gloom, even if you don’t suffer from seasonal affective disorder. The thought of winter coming back again, plus the added stress of the holidays can have a severe effect on anyone’s mental health. Be proactive this month in order to improve your mental health. Sign up for some online therapy sessions that you can do at your own pace in preparation for the stress that lies ahead. Stock up on aromatherapy supplies and enroll in a yoga class. Being prepared for the most stressful season ahead can help you feel less overwhelmed. Whether you start your Christmas shopping early or leave it to the last minute, there should be someone who is at the very top of the list. You. This is the month to indulge. Buy that special something you’ve always wanted but felt guilty splurging on. Or sign up for a monthly self care box. I mean, sure, Christmas is coming and you could always add it to your wish list – but there is something so meaningful and significant about buying something yourself. It’s a way to remind yourself that you are in control of your own happiness. Prioritizing yourself doesn’t make you a selfish person. You need to take care of yourself so that you can take care of others. With the holiday season coming up, your focus is going to shift to your family and friends and making the holidays memorable. So take the time now to refill your heart and mind. This can be a stressful month for many different reasons: the financial strain, the stress of Christmas shopping, the long list of events, and anyone who has lost a loved one will miss them especially around the holidays. One of the best ways to improve your mental health this month is to scale things down. There is a lot of pressure, especially on mothers, to make Christmas memorable. Mostly because, when we look back at our happiest memories – they are at Christmastime and we want that for our children as well. But it’s not about the size of the tree or the gifts. It’s not about how many crafts or activities or advent calendars there are. The things we remember most about the holidays is getting together with everyone. If you want to improve your mental health, scale back the holiday decorations and festivities and focus more on enjoying time with family. Get this FREE printable 12 Month Mental Health Calendar in the Running in Triangles Free Resource Library, available exclusively to subscribers of the Postpartum Depression Survival Guide. Click here to subscribe. Moms tend to forget that they are number one. When you’re a mom, it’s very easy to devote all your time and energy to parenting. Children have a lot of needs, especially when they’re younger. And although their needs tend to be time sensitive and consuming, using the right self care strategies can ensure that you make yourself a priority. It’s important to be selfless, but it’s also crucial that you find the time to look after number one. Here are some helpful self-care strategies that moms should remember. *This post contains affiliate/paid links which means that if you click on one of these links and buy a product, I may earn a small commission at no additional cost to you. Rest assured that I only recommend products that I love from companies that I trust. Stress is a very common problem faced by parents. Sleep deprivation, having to be on the go all the time and feeling like you never have enough hours in the day can all increase the risk of stress. Other factors, such as relationship worries, money problems and trying to balance work and parenthood may also play a part. If you’re struggling with stress, the one of the best self care strategies is to try and work out exactly what is bothering you and causing you to feel on edge. Often, there are practical solutions. Take the example of managing your money. If you’re finding it tough to get by from month to the next, or you’re trying to figure out ways to boost your credit score to get a mortgage, or you’re attempting to pay off debt, there are steps you can take. It’s useful to see a financial adviser, to start budgeting, and to use services like my fico to monitor your credit score. There are myriad causes of stress, but if you let them take hold of you, even the most innocuous-seeming problem can spiral into something all-consuming. Learn to spot signs of stress, and try and manage it before it gets worse. Everyone is different, but popular self-care strategies include exercise, meditation, and creative activities. It’s no lie that parenting is a full-time job. Even when kids are fast asleep, as a parent you’re still thinking about them and probably worrying about them too. Children do take up a lot of time, but there’s always room in the day for a bit of ‘me time’ too. Make sure you take advantage of breaks. Schedule in half an hour to do yoga, an hour to catch up with friends or a night off from time to time to go out with your partner. It’s so important to be able to have that time out to recharge your batteries, relax, and connect with others without the kids in tow. We all love our children, but there’s no harm in having a breather now and again. Scheduling some alone time is one of the most important self care strategies a mom can do. When you become a parent, you tend to focus on what makes your kids happy, but try not to lose sight of what perks you up or brings a smile to your face. None of these self care strategies even matter unless they’re bringing you joy. It’s crucial to work on your mental health and to find time to pursue hobbies and interests, engage in social activities and enjoy time doing things you love. Whether you like reading, painting, writing, dancing, or running, give yourself time to do what makes you content. As a mom, you probably spend most of your time looking after your children. While they may feel like your number one priority, remember that you are still responsible for taking care of yourself too. And you will only be able to take care of them if you also take care of yourself. Creating a self care sanctuary in your own home is easier than you might think. While the term “self care sanctuary” might sound fancy, it’s really just a place filled with things that make you feel comfortable and at ease. Having a dedicated space to practice regular self care can make doing it seem like less of a chore. For women battling postpartum depression and anxiety, it can be a place to get away from the everyday mess and chaos that’s associated with motherhood. Your self care sanctuary can be anywhere you choose. It doesn’t need to be a separate room in your house – it can be your bedroom, bathroom, or even an outdoor space in your backyard. You should be able to access it easily and on a regular basis. Most importantly, it should be a place that you enjoy being and where you feel like you can focus on yourself, regardless of how much time you have. Here are some tips on how to turn your space into a self care sanctuary. The first thing you need to do to create your self care sanctuary is detoxify the space. Clean the area thoroughly using non-toxic cleaning products and get rid of any clutter or unnecessary items. A minimally styled space opens the door to peace and healing and will allow you to focus on yourself without being distracted (and let’s face it, who can relax in a dirty room?). Once you have a clean, clutter-free space, you can start to incorporate different things to purify the air. Burn some dried sage. The ritual of sage burning can remove the negative energy from within the room (also called smudging). Light candles or incense to promote a healing environment. Try a Himalayan salt candle holder for extra purifying benefits! Use essential oils in a diffuser. Here’s an all in one kit. Adopt a houseplant. Choose one of several plants that clean and purify the air in a room. Outdoor spaces filled with flowers and greenery are also perfect locations for a self care sanctuary. Your self care sanctuary is a place where you can go to detoxify from the inside out. This is why it’s so important for it to be free of toxins and negative energy. The environment should never feel sterile, but it should feel fresh, clean and pure. Every mom should have a place where they can avoid dishes, dirty diapers and scattered toys – even if it’s just for a few minutes a day. When it comes to self care, comfort is essential. It’s almost impossible to relax when you feel too hot or too cold or if your clothes are restricting and uncomfortable. Escaping to your self care sanctuary means you get some time away from being climbed on like a jungle gym, or constantly being needed and pulled in different directions. Consider all the different aspects that make you feel comfortable. Choose furniture that you truly love to curl up in. It can be a bed, sofa, lounger, hammock, swing or something else. Try to think outside the conventional idea of comfort. Dress comfortably, whatever that means to you. You can put on pajamas, a robe or even relax completely naked! Slip on some wooly socks, house shoes or try some toe spreaders. Invest in a weighted blanket. Weighted blankets have been scientifically proven to help ease stress and anxiety. Your self care sanctuary is the ultimate place of comfort and relaxation. This means different things to different people. For example, I prefer to be warmer rather than cool and so I love my cozy blankets and fireplace. But someone living somewhere hot may need a fan or open window to feel comfortable instead. Try out different things until you find the right combination of comfort. Stimulate your brain visually and create a feast for the eyes. Even if you plan to keep your eyes closed the entire time, your self care sanctuary should still be filled with beautiful views. The things we look at each day, whether we focus on them or not, form part of our subconscious. Use positive imagery to help retrain the subconscious mind. Look out the window. If you have a naturally beautiful view through your window, then make it your focal point. If you don’t have a great view, install beautiful window coverings or hang plants or sun catchers instead. Cover the walls. Cover the walls in artwork, favorite photos or motivational posters. Paint the walls a soothing color or make a chalkboard wall where you can write your own inspirational messages. Decorate with intention. Lighting fixtures, decor, plants and furniture all contribute to the overall feel of your self care sanctuary. Try to choose pieces that you love or that have special meaning to you. Your self care sanctuary is a visually stimulating place that inspires you. If your self care sanctuary is normally a communal space, then you can still keep it in line with the design of the rest of the house. Print and frame quotes that inspire you and hang them up in the rest of the house too (Etsy is a great place to find some). Even if you don’t read them everyday, your mind will soak up the beauty, inspiration and positive vibes. Our skin has a lot to put up with on a daily basis, and yet, it’s one of our most neglected organs. We can end up feeling really over touched at the end of a long day of caring for children. Treating the exterior of our bodies is a great way to feel refreshed and should be an essential part of any self care routine. As mothers, we tend to keep things low maintenance on a daily basis, sticking to the bare necessities of skin care. Escaping to a self care sanctuary is the perfect time for a little bit of pampering. Do a home spa treatment. Apply a face mask, cooling gel eye mask (or cucumbers), coat your hair in coconut oil and wrap it in a warm towel. Soak in the tub. Add some epsom salts to soothe sore muscles and absorb magnesium to help fight anxiety and depression. If baths aren’t an option, then soaking your feet offers the same benefits. Exfoliate and Moisturize. Exfoliating the skin is a great way to feel refreshed and soften the skin but don’t forget to moisturize afterwards! Try this all-natural line from Rocky Mountain Oils. Try dry brushing. This is one way to stimulate and exfoliate the skin while also improving blood circulation and reducing stress. Your self care sanctuary is where you go to feel renewed and refreshed. Keep a basket of your favorite skin care products in your self care sanctuary. This way, you’ll be able to pamper yourself any chance you get. You don’t need to go all out on skin care every day, but remember to take care of yourself on the outside as well as on the inside. As important as it is to take care of the outside of our bodies, we also need to remember to take care of what’s inside as well. Leave any thoughts of dieting or weight loss outside the self-care sanctuary. Eating healthy food is something we should be doing all day long and not just during our self care time. There are still things we can do routinely while in our self care sanctuary that help to cleanse the entire body. Drink lemon water. This simple combination has many health benefits, especially for those suffering from depression and anxiety. Indulge in healthy drinks. Sip on smoothies, green tea or naturally flavored water. Practice deep breathing. Take long, slow breaths to help clear the lungs and feel energized. Meditate. Try using a guided meditation app or simply spend some time being mindful. Your self care sanctuary is where you can reset your mind and body. Create a routine for yourself that includes daily trips to your self care sanctuary. Then incorporate all the things you should be doing on a daily basis, such as taking vitamins and checking in on your overall health and well being. Eventually, it will become second nature. While your self-care sanctuary doesn’t need to be fully stocked with gym equipment, it should have enough space for some physical movement. You should never feel obligated to “work out” during your self care time, because that can cause added pressure and might make you avoid it altogether. But physical movement releases happiness-inducing endorphins, which are definitely a good thing. There are several different ways to incorporate physical movement within your self care sanctuary. Stretch. Simple stretching can loosen up a stiff neck or back, a common side effect of stress. Run. Running on a treadmill can help to burn off extra pent up frustration or anxiety. Yoga. This popular option has several benefits for treating depression and anxiety. Dance. Turn on your favorite music and let it move you. You can literally dance like no one is watching. Punch. If you find that you suffer from anger management problems or postpartum rage, install a punching bag. Your self care sanctuary is an outlet for releasing emotions in a physical way. The point is not to burn calories or build muscles. The point is to connect with your body, get your heart beating and find an outlet to express any negativity. And if you just don’t feel like doing anything physical that day, it’s perfectly fine. Don’t ever feel pressured to have to do anything at all during your self-care time. A self care sanctuary should be a safe place for you to express yourself. Often, it’s hard to communicate what we feel using words alone. Art is a different outlet for expressing the stress and feelings that often get built up inside of us. Artistic expression comes in a variety of different forms. Journaling, drawing, coloring or painting. You don’t need to be a professional artist, and it doesn’t have to be a masterpiece. Crafting, knitting, sewing or macrame. Don’t try to copy something you saw on Pinterest. Instead, use it as a way to express yourself and only do it if it makes you happy. Check out some of these DIY craft kits on Etsy. Woodworking. This one is a little more extreme but many people use woodworking as a form of therapy. The art of working with your hands to create something out of nothing can be so rewarding. Singing or playing a musical instrument. Don’t feel like you need to be a good musician, sing along to your favorite songs or teach yourself how to play a new instrument without any judgement. Blogging. This can be a job, but it can also be a hobby that helps you express yourself through writing and graphic design. Your self care sanctuary is a place for self-discovery. It might take some time to find the right creative outlet and it may change regularly. If there’s something new you wanted to learn how to do, then the serenity of your self care sanctuary could be the perfect place to start. You never know what you are capable of until you give it a try. Having some time and space to work on what’s important to you is a great way to practice self-care. Once you’ve created the ultimate self care sanctuary, schedule some time to use it! Download this free PDF workbook designed to help you establish a working self care routine, even as a busy mother. Taking time for themselves is something that all moms need to do but practicing a self-care routine is essential to treating postpartum depression. Self-care doesn’t always need to consist of spa days or alone time. While different things appeal to different women and personalities – there are some simple, basic, everyday tasks that can make a huge difference to one’s mood and patience level. Keeping postpartum depression symptoms under control means having to stay one step ahead of them, otherwise it’s very easy to drown in the shuffle of everyday motherhood. Here are some self care tips for mothers battling postpartum depression. It’s all the things you need to do to take care of YOU. It’s not being self-ish and putting yourself first. It’s adding your needs to the list, at the same priority level as everything else. Self-care is a huge topic among parents, especially stay at home moms. And the biggest question it raises is how the heck are you supposed to take care of yourself AND the tiny humans who demand so much of your attention? The nature of a mother is to put their children first and therefore, self-care often gets bumped to the bottom of the to-do list. I’m quite guilty of it myself and sometimes life gets SO busy that I don’t even realize how long it’s been since I showered or blow-dried my hair. Trying to fit a self-care routine into an already packed day is impossible, I know. There are never, nor will there ever be, enough minutes in the day to get everything accomplished. This means you’re going to have to sacrifice something. It could be sleep (sleep? what’s that? ), it could be that extra time with your kids before bed, it could be the gourmet dinner you cook every night. Or perhaps there is a way to work your self-care routine into your existing routine with the kids. There’s no rule that says self-care must equal alone time so feel free to involve your kids or partner. Whatever you need to do, do it and make time for you. During my own battle with postpartum depression – I could never look at myself in the mirror. I was embarrassed and ashamed of the pile of muck I had become. I had a ghastly image of myself in my head and I feared that if I looked at myself in the mirror I would realize it had come true. The few times I did make eye contact with myself, I immediately broke into tears because I absolutely hated myself and standing in front of the mirror meant coming face to face with my worst enemy. But I wasn’t afraid to look at myself when I had a little makeup on. When I was showered and my hair was done and I was in decent clothes – for a moment, I forgot about that pile of muck. This was someone else I was looking at, talking to, admiring in the mirror. That pile of muck was still there but I didn’t have to look at her. I didn’t have to face her and all the sadness she brought with her. So while some might consider self-care a type of vanity, I felt that it was the only way for me to escape the rut I was in. Developing a good self-care routine is extremely important both during your battle with postpartum depression after you’ve started treatments to reduce the chance of a relapse. Begin with the bare minimum. It’s sad that we have to remind ourselves to do these things each day, but over time they become less and less of a priority. For a new mom, it’s hard to figure out how to take care of two people instead of one. Or for a mom with a mental illness, these are some things that don’t seem worth the trouble. But they are worth it – and it is possible to do them, every single day. So simple right? Not when you’re awoken by the loud screams of children at 6 am. You rush out of bed to see what’s happening and deal with whatever new fiasco they’ve created. And then coffee is the first thought on your mind. You’ll brush after coffee – that makes sense, right? Then you won’t have coffee breath! Smart woman! There are so many days when this feels like an impossible feat. It takes more than a few minutes and we all know what kind of trouble kids can get into in that time. If it means letting them have some extra screen time while you shower, then it’s worth it. If all else fails – take them in with you! But putting it off means you’re putting yourself off, and self-care is all about putting yourself FIRST! So take the shower! A nice, hot shower before bed is a great way to help you sleep at night, so if you can’t fit one in during the day – try to squeeze it in after the kids are down for the night. If the thought of taking a shower feels like the last thing you want to do after an extremely long day, then it’s what you need most. Trust me and just TAKE THE SHOWER!!! Changing from flannel pajama pants into black leggings counts. Don’t stay in your pajamas all day even if they’re the comfiest thing on earth and you’re not going anywhere anyway. I’ve gone so far as to use the excuse that I don’t want to make more laundry for myself. But even if you wear the same “daytime” clothes for a week – change out of your pajamas. The act of changing your clothes – even if they are from one pair of sweatpants to another, is enough to trick your brain into thinking you’ve done something productive. This one is more important to some than others. I’ve never been a “full face makeup” type of person, but some women absolutely love the process of experimenting with makeup. I got a chance to try the Marc Jacobs Velvet Primer and Mascara for free and it was like putting on false lashes without the fuss! Join Influenster and you can start getting free products to try, too! If you have a particular problem area that makes you self-conscious then take care of that so you can feel confident enough to face the world. It might sound superficial or vain, but it’s amazing how much more confident you feel when you know that you look good. And keep in mind that the only person you’re trying to impress… is yourself. Every time I start to feel overwhelmed, a little “you can do this” under my breath reminds me that I need to stay positive. It is SO easy to lose that motivation when you are battling postpartum depression because you are in a constant state of darkness. Find some way to remind yourself to stay in the light. Sufferers of postpartum depression are infamous for their terrible eating habits – either not enough or too much. And because of that, we often end up with all kinds of vitamin deficiencies which can have a huge effect on our mental health. So if you’re not able to eat as healthy as you should, you should be taking supplements in order to get your levels back up to where they should be. Magnesium is what worked wonders for me. Magnesium deficiencies are known to cause symptoms of depression, so make sure that you take a regular magnesium supplement to keep symptoms at bay. Vitamin D – get outside in the sun! Not only does 20 minutes in the sunshine top up your Vitamin D levels but the fresh air does wonders for your soul. Vitamin B Complex to make sure you’re getting the right amount of nutrition despite your messed up appetite. Here’s an article on www.livestrong.com that has more details on the best herbal and vitamin supplements to treat postpartum depression. Yoga is a great low-impact exercise that can help to get rid of some of the physical aches and pains associated with postpartum depression. You don’t need a gym membership or any fancy equipment, so it’s very easy to incorporate into your lifestyle. It also helps you to clear your mind of distractions and intrusive thoughts, which is important if you want to try to remain positive on a daily basis. Deep breathing can help greatly to reduce stress and it’s something that you can do anytime throughout the day. Focus on ONE extra activity that makes you feel happy and relaxed and ONE thing only. As moms we spend most of our days multi-tasking, and there is so much pressure to become a mom who can bake and sew and do crafts and plan parties (thanks a lot, Pinterest) and it becomes overwhelming and exhausting. Your self-care routine should consist of something that makes you feel happy and relaxed afterwards. It doesn’t have to be productive and you don’t need to justify it. You just need to do it. It can be difficult to fit in time for self-care, especially as a busy mom. Check out my post How to Create a Self-Care Routine as a SAHM for more tips plus download a free workbook to help you create a schedule that works! Keeping a journal of your thoughts can be hugely therapeutic for postpartum depression survivors in many different ways. Not only is the act of writing out your thoughts and feelings a way to release them, but it also helps you keep track of whether they are getting better or worse. Whatever self-care routine you end up carving out for yourself, make sure that you stick to it in order to prevent relapses. Communicate with your partner about how important these things are for your mental health so that they can support you. And don’t ever feel guilty about putting yourself first because if mom is happy, then the entire household is happy. Download a FREE Self Care Workbook to help you create a routine that works for your busy schedule!